​Sundays tend to be quiet and lazy days, but September 23 was different in the Fall Creek and Northside neighborhoods of Ithaca. 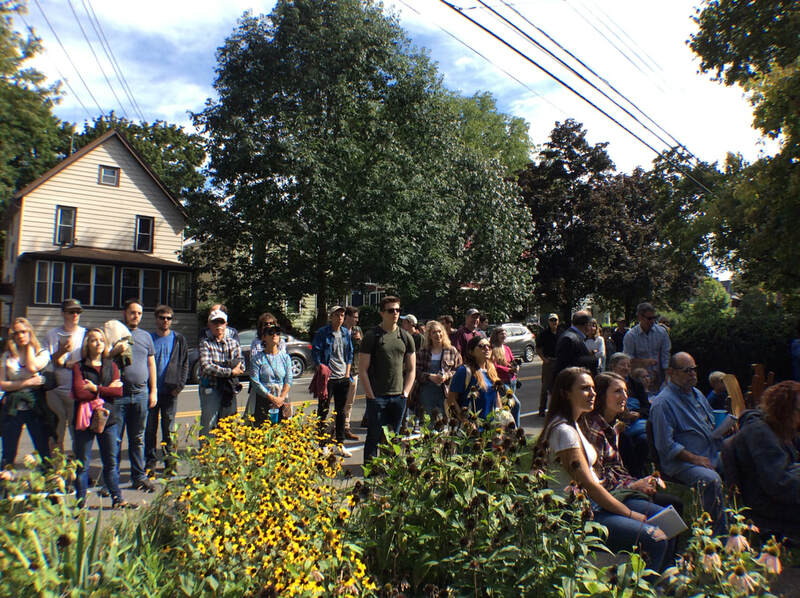 Ithaca residents took to the streets to listen to live music as part of the 12th annual Porchfest. Unlike most musical events, the musicians weren't playing on stages; instead, they were playing on the front porches of ordinary houses. Crowds of people formed on the sidewalks in front of the porches and often spilled out into the streets. Throughout the performances, the crowd sizes varied as people stopped to listen and moved on to get a chance to hear other musicians. One hundred sixty-eight musicians played on porches for one-hour time slots from 12:00 p.m. until 6:00 p.m. all around downtown Ithaca. Some artists played at their own homes, while others had to barrow porches. A few Ithaca residents who have porches but don't play music held auditions to find the right musicians to play on their property. ​Since Harrison Lindsay, otherwise known as Hal Guitarist, moved to New Jersey after living in Ithaca for five years, he had to reach out to Porchfest's organizers to be paired with a venue. Lindsay made the trip back to Ithaca to play folk music with his friends Tyler Bage and Adam Siegler. Lindsay sang lead vocals and played the guitar and harmonica. He was accompanied by Bage on fiddle and Siegler on bass. For some songs, Siegler also sang backup vocals. The trio performed a mix of covers and original music written by Lindsay. Most of the original songs, which had strong political themes, preached acceptance and social equality. While some of the pieces were serious in tone, others were more light-hearted. Lindsay said that while his original songs are new, they fit into the mold of traditional folk songs. ​While Lindsay and Siegler are Porchfest veterans, this was Bage's first year performing at the event. 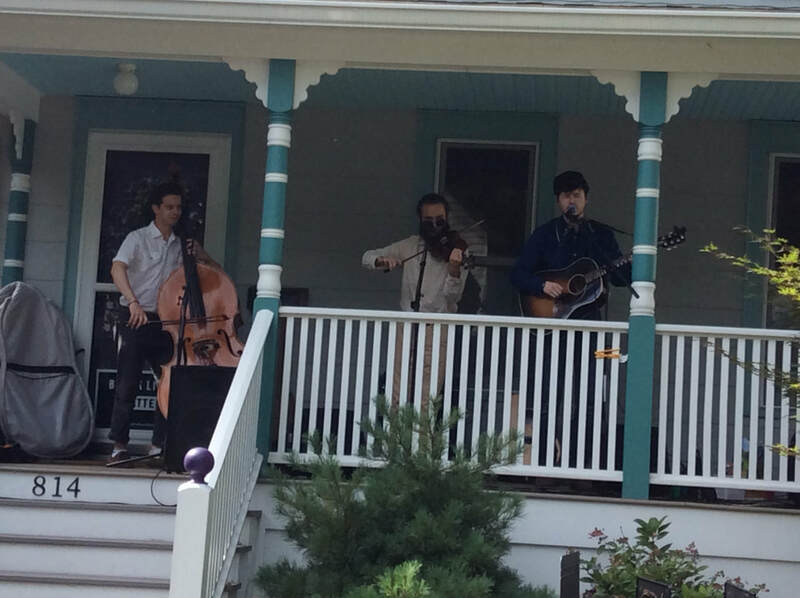 Bage described the difference between attending Porchfest and performing as "interesting," and said that he feels like he connects more with the audience each time he performs. "That's what I love about playing folk music, it speaks to the individual...you don't have to take course after course in music theory to understand and get up and dance to it," he said. Bage, Siegler and Lindsay all mentioned how much they enjoyed making music with their friends. In fact, Lindsay first got involved with PorchFest after hearing another friend talk about the event and how great all of the bands were. "Everybody in this town comes out of the woodwork just to see everybody play," said Lindsay. ​Porchfest is also an opportunity for people in Ithaca to hear new music. Siegler said, "There's so much great music that Ithaca as a town and as a community has to offer that a lot of people don't hear about until days like today, where they come out and celebrate together."